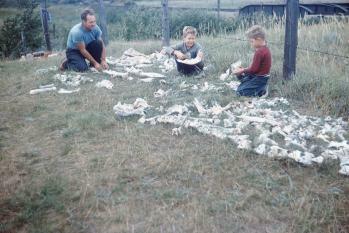 Boyd Wettlaufer with his young sons, sorting buffalo bones, Mortlach, September 1954.
archaeology is the study of human history and prehistory through analysis of sites and physical remains. In Saskatchewan, Archaeology began as part of a scientific expedition in the 1850s. Yet the basis was laid earlier, when fur traders/Explorers, such as the La Vérendreys, Alexander Henry, and David Thompson described the Fur Trade and Aboriginal cultures in the region. Some of the early explorers noted signs of previous human existence. For example, Peter Fidler recorded some Fur Trade Posts and stone circles. Such observations established the existence of archaeological remains throughout the Western Interior, but not their antiquity. This changed during the 1800s, when it became important to determine the age of remains and changes over time. During the late 1850s, scientific expeditions explored the region, and several earthen mounds in the east were excavated. The explorers concluded that the mounds were made by humans who predated the traditions of current Aboriginals inhabiting the region. Near the Qu'Appelle River, the explorers observed numerous stone rings, which they correctly interpreted as sites of former tipis. Since tipis were in common use in the area at that time, expedition members decided they were of Cree manufacture and, believing that the Cree were newcomers to the region, concluded that tipi rings were a recent historic phenomenon. They summed up their archaeological observations as representing a recent historic Aboriginal occupation, and a somewhat older mound-building period confined to the eastern part of the region. This seemed to leave the archaeological potential of Saskatchewan and Alberta with prospects solely of historic interest. In Manitoba, questions regarding the burial mounds became subjects of curiosity and study. Between 1879 and the mid-1880s, amateurs carried out excavations and surveys. They were able to show that the mounds were at the northwestern edge of their distribution, which seemed to be centered in the Mississippi valley. They also determined that some of the mounds had been built several centuries before the arrival of Europeans, and that some of them had been used for burials at different times. This subject was of such interest that the Smithsonian Institution reported in 1993 that the North American burial mounds were made by historic Aboriginals or their direct ancestors. This made it appear that all archaeological remains in the Great Plains area dated to historic times, resulting in a decline in interest in their archaeology. Nevertheless, mound investigations continued sporadically into the early 1900s, when the first of a few burial mounds in Saskatchewan was discovered. In 1907, Dr. Henry Montgomery from the University of Toronto excavated at the Halbrite mound in the southeast. His report, published in a scholarly journal, created the first real archaeological Literature for Saskatchewan. Even though archaeology had lost an important motivation - the desire to know the age of things - people continued to make discoveries. For example, in 1896 the Reverend John Maclean recorded a large boulder monument on a hill near Moose Mountain. At the centre was a cairn surrounded by a heart-shaped ring of stones. Lines of stones radiated out from the ring and ended in small cairns. However, Maclean was unable to discover the origin or purpose of this monument. In 1905, Charles Noddings, from near Beaver Hills, made another discovery, a slab-like boulder with a face carved onto one side. Noddings pressured the provincial government to protect the object, and it became the first object in the new museum's collection. It helped sustain public interest in Saskatchewan archaeology until the development of an archaeological program in the 1950s. Until the end of the 1920s, Saskatchewan archaeology remained basically a collection of curiosities with little temporal framework. Then, a radical series of changes occurred in archaeology, including the discovery that human occupation of the Great Plains was not limited to historic times. Between 1926 and 1932, distinctive fluted spear points were found in New Mexico that were directly associated with extinct Bison and mammoths, extending human occupation back 10,000 and more years. These discoveries provided Plains archaeology with a lengthy chronological framework. A bit later, the natural and economic environments also became more conducive to archaeology. The 1930s brought Drought and economic depression to the Plains. The drought caused wind erosion, which exposed formerly buried artifacts, including arrowheads, other stone tools, bone tools, and pottery. Furthermore, with opportunities for recreation limited by the economy, artifact collecting became popular. People began to ask questions: Who made these objects? When? Why? To seek answers, collectors compared their finds with one another, but the newness of the finds meant that much Saskatchewan material was unique. To enhance the sharing of information, in 1933 the amateur Saskatchewan Archaeological Society was formed in Regina. A Saskatoon society followed in 1935. They identified artifacts and published a newsletter, but without professional expertise and funding they lacked the means to create a reliable temporal framework. Institutional support simply was not available until after World War II. 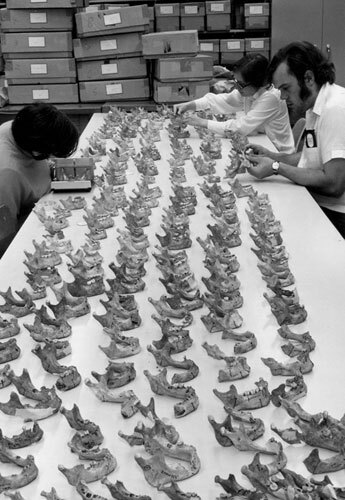 Measurements of human jawbones from prehistoric site near Swift Current. During 1951, Boyd Wettlaufer, working out of the Museum of Natural History in Regina, conducted the first systematic archaeological survey in Saskatchewan, followed in 1954 by the first scientific excavation at the stratified, seven-layered Mortlach site, a bison hunters' campsite in the south. The subsequent report established a firm chronological framework reaching back 3,500 years, and described diagnostic artifacts for each layer. Later in the decade, Wettlaufer helped excavate the Long Creek site, also stratified, near Estevan, and extended the dated occupation back to 5,000 years ago. The two reports provided a scientific chronology for almost half of Saskatchewan's human history. In addition to this fundamental work, Wettlaufer also helped establish the first radiocarbon dating laboratory in western Canada at the University of Saskatchewan. History and archaeology first merged in Saskatchewan with studies of the fur trade. From the 1920s to the 1940s, Arthur Morton did important work in this field. He located and identified a large number of fur trade post ruins, and arranged protection for the FranÃ§ois-Finlay posts near Nipawin. In 1949, John Archer reported on an even broader range of Historic Sites in Saskatchewan. Another such study was done in 1951 by Jack Herbert. Together, these reports helped launch a provincial historic sites service, which eventually got involved in historic archaeology. The first major historic site excavation in Saskatchewan was carried out by Alice Kehoe in the mid-1960s at the FranÃ§ois-Finlay posts. This began a trend which addressed a much broader range of historic sites and structures, including Pioneer farmsteads, abandoned villages, brickyards, Hospitals, battlefields, and others. Regarding Aboriginal sites, an important event was the hiring of Thomas Kehoe as curator at the Saskatchewan Museum of Natural History (now the Royal Saskatchewan Museum) in 1959. The result was reconnaissance and excavations in both the north and the south. During the early 1960s, work also was done in the valley of the South Saskatchewan River that was scheduled to be inundated. In 1962 government responsibility for archaeological remains was bolstered by the addition of antiquities clauses within parks legislation. In 1964, the University of Saskatchewan established an Anthropology and Archaeology department with Zenon Pohorecky as head. This meant that students no longer had to leave the province to obtain training in archaeology, and by the late 1960s major projects were being directed out of the university. The last three decades of the 20th century were times of consolidation and integration for Saskatchewan archaeology. There were many studies of individual cultures of particular sites and features, methods, and past culture-environment relationships. The oldest parts of the archaeological record, 5,000-12,000 years ago, began to yield their secrets. Good, broad picture syntheses now exist as well. The Saskatchewan Archaeological Society, the Museum, and the University of Saskatchewan are more active than ever. One of the biggest recent changes in archaeology has been the enactment and enforcement of heritage legislation, beginning in 1980. Now, field archaeology is controlled by the provincial government, requiring pre-development assessments. The result is that most of the field work in archaeology now is done by consultants, whose activities are regulated by the government. Integration has occurred in two ways. First, over the past 30 years, Aboriginal concerns and involvement have become part of archaeology. The creation of the First Nations gallery at the Royal Saskatchewan Museum, and the Wanuskewin museum near Saskatoon are exemplary in this regard. Schools, too, are beginning to integrate Saskatchewan archaeology into their curricula. Thus, over the past 150 years, Saskatchewan archaeology has developed in synchrony with the rest of the world, and is now an important ingredient in the investigation and preservation of the province's heritage. Dyck, I. 2001. “The Last Quarter Century in Canadian Plains Archaeology,” Prairie Forum 22, no. 2: 143-68; Montgomery. H. 1908. “Prehistoric Man in Manitoba and Saskatchewan,” American Anthropologist 10, no. 1: 33-40; Wettlaufer, B. 1955. The Mortlach Site in the Besant Valley of Central Saskatchewan. Anthropological Series No. 1, Saskatchewan Museum of Natural History, Regina; Wettlaufer, B. and W.J. Mayer-Oakes. 1960. The Long Creek Site. Anthropological Series No. 2, Saskatchewan Museum of Natural History, Regina.